The Asian Institute of Technology (AIT) offers oneyear Professional Master degree in Aquaculture Business Management (Aqua-BM) in response to the needs of the fastest growing food production sector. The courses have been designed to provide business management skill in addition to the latest scientific knowledge and innovative aquaculture technologies to prospective entrepreneurs and practitioners involved in aquaculture industry with a view to unfolding their potential roles in fast-tracking the pace of "Blue Revolution" keeping in mind that aquaculture﻿﻿ needs to double the global fish production by 2030. List of course to be posted later. Teaching faculty are internationally renowned experts from various schools within AIT and internationally reputable universitties abroad, and Selected experts from private as well as public sector are invited to teach some courses. 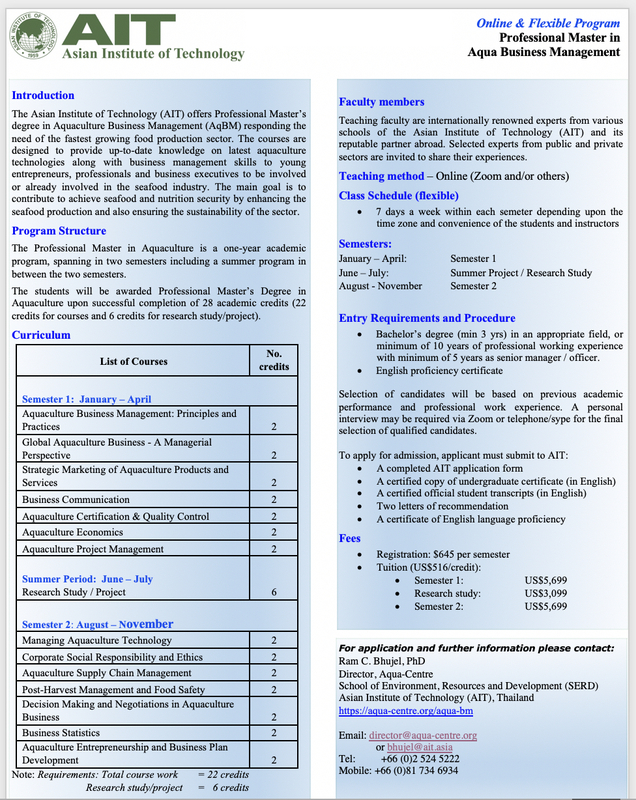 Venue: AIT main campus near Bangkok (AIT is a green campus which accommodates almost all the﻿﻿﻿ students and staff who come from more than 30 countries﻿). A certificate of English language proficiency﻿.